I just retired and I have my sites on either buying or making a replica pair of ARLSTs. Okay second question, where do I get the plans to make the cabinets and wiring schematics as well as the raw speaker systems. Any info would be appreciated. No matter which way you try to attack this project, reaching your goal will present more than a few hurdles. LST's do appear on the used market from time to time, but not very frequently, and always with a steep price. As far as trying to build a pair from scratch, each major step will be formidable: cabinet construction requires significant woodworking skills; crossover assembly is dense and sophisticated; and, locating and obtaining eighteen suitable original drivers will take patience, persistence, and deep pockets. Nonetheless, a couple of recent threads from these pages have addressed this issue, and along with the attached schematic, these should begin to describe the level of challenge ahead. 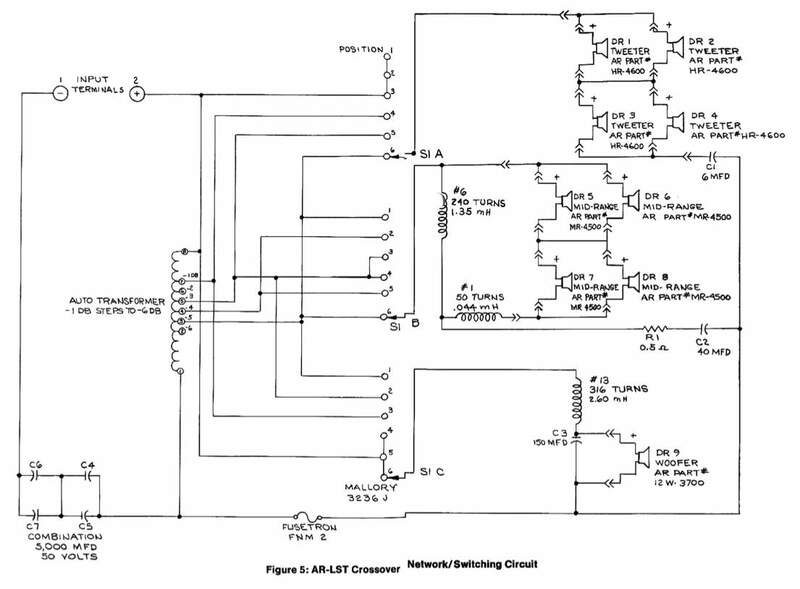 That is the early schematic. There are some other possibilities perhaps if you are intent on the design concept but don't wish to hand-wire auto transformers. One would be to use active equalization, AR woofers and substitute high frequency drivers, perhaps from later AR models. I think there is a post related to this in the archives quoting Roy Allison on this topic. Still a bit of a challenge and the cost of a set of LST's will probably seem trivial when all is said and done and your heirs will actually have something salable.